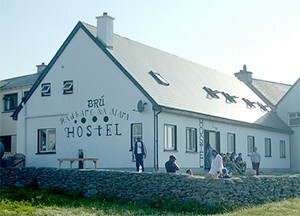 Brú Radharc Na Mara Hostel is run by the Sharry family who are catering for accommodation needs of tourists visiting the Aran Islands for many years. The hostel offers a choice of self-catering or Bed & Breakfast accommodation. The hostel is situated on the waters edge overlooking the bay and neighbouring islands yet centrally located on the island with all amenities just a short walk away. There is a choice of dormitory or private room accommodation. Dorms are kept to a reasonable size of 4-6 beds to avoid crowded rooms. Private twin, triple and double en-suite rooms are available. Bed linen is provided and towels are available for rent.